uk.nm has no other items for sale. Never received and Seller was not helpful and rather rude. It works as advertised. Remote control is a great feature. Also, touch control at the top of the light is great to adjust without remote. Will recommend to future buyers. Rated 3 stars only because base weight is not sufficient to lamp from tilting over. I thought from picture the lamp would be more substantial. Does work good with brightness. Very lightweight, easy to move. Makes giving my husband a haircut much easier. Lots of variable intensities of light and also warm and cool white light. 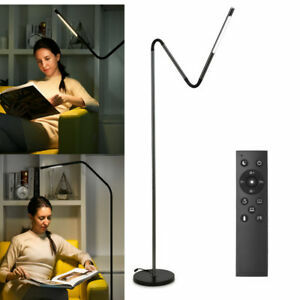 Great reading light. This is a very nice addition to my favorite reading chair. Very clean looking, unobtrusive,,love the remote control. The five programmed settings and custom adjustments make it super versatile. I find that I’m really using it for far more tasks, great computer setting.